Get ready for fireworks! 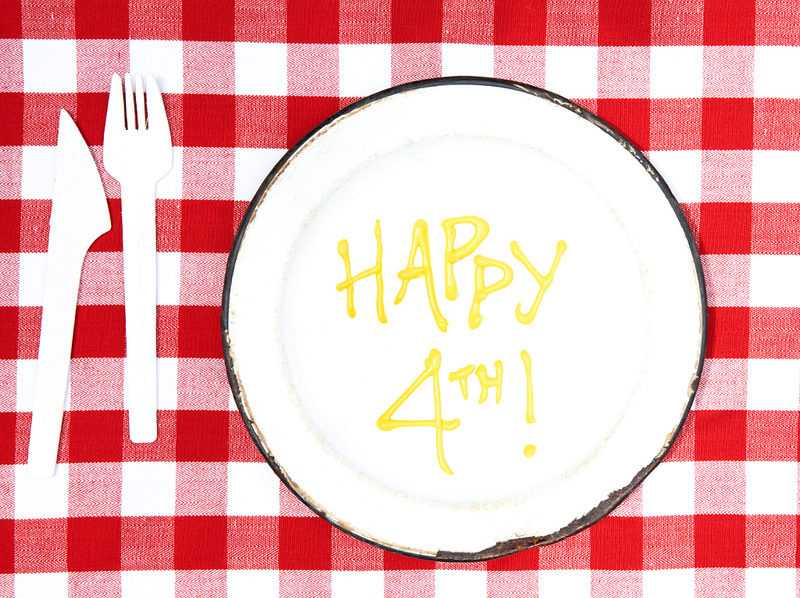 This 4th of July we’ll be making hot dogs with a little more than just ketchup and mustard. 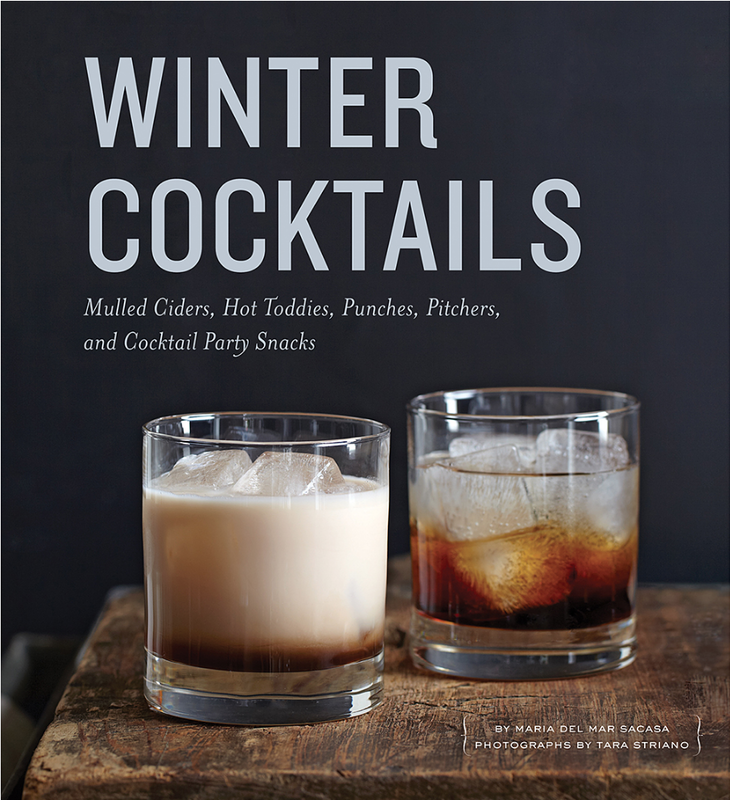 We can’t decide which is our favorite. Tell us what you settle on! Fresh, fresh, fresh! We’re getting ready to perk up basic potato salad with a series of recipes, but we couldn’t wait and broke this one out for the weekend festivities. No more powdered spice mixes or bottled dressings! This dressing is all fragrant herbs. Take note of the 2-step dressing process: your potato salad will have more flavor than ever. Sure, you can buy canned baked beans, but these are sparkler-dazzling. Also, you probably have most of the condiments in the recipe lurking in your pantry already. Make them a couple of days in advance and reheat them in a cast iron skillet or a disposable foil pan right on your grill when you’re ready to serve. Add a little water to the beans if you need to loosen the sauce up a bit. – Heat the lard over medium-high heat in a Dutch oven or other large pot until shimmering. Add the ham and bacon and cook, stirring, until crisp and brown. Add the onion, season lightly with salt and pepper, and cook until translucent, about 7 minutes. Add the garlic and cook 1 minute. Add the tomato paste and brown sugar and cook, stirring, 2 minutes. Whisk in the molasses, then the ketchup, mustard, vinegar, Worcestershire sauce, and water. – Bring the mixture to a boil, then reduce the heat to medium and stir in the beans. Cook until the sauce is thickened and the beans are warmed through, about 30 minutes. Season with salt and pepper, and adjust with vinegar and Worcestershire sauce, if desired. – Grill the franks outdoors or cook them on a grill pan, or even a standard skillet with a pat of butter, until they’re nicely browned. Place them in the buns and top them with baked beans and mustard. I can’t get enough of this recipe. My soon-to-be sister Whitney took me to downtown L.A. years ago and introduced me to these hot dogs. They were cooked on a bunsen burner on a sheet tray, right there in the middle of a busy street. There was a huge bowl of fresh guacamole on a cooler in the front, surrounded by bottled Jarritos sodas. 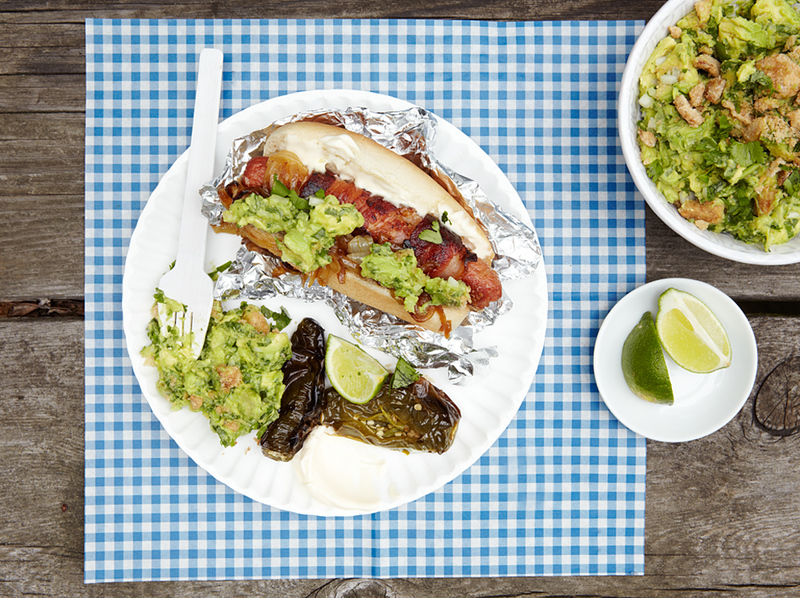 Bacon-wrapped, grilled, topped with charred onions and jalapeños, and topped with creamy guacamole, you’ll have a line of customers at your own grill. Oh, and, yeah, there are chicharrones in the guacamole. – Set a grill or grill pan to high. If using a grill, set a large cast iron skillet on the grill to preheat. You can also use a grilling basket. Drizzle the jalapeños with oil and set them directly on the grill, if using. Season the onions with salt and pepper, and drizzle with olive oil. Cook them in the preheated cast iron or on the grill pan, stirring occasionally, until caramelized. Transfer to a serving platter. – Roll the sausages in cornstarch. Wrap 1 bacon slice around each sausage: the cornstarch will glue them together. Cook the hot dogs in the skillet until the bacon is crisped and browned. Tuck the sausages into buns spread with mayo, and top with the onions and jalapeños. Serve with guacamole. – Scoop the avocado flesh into a medium bowl and season with salt and pepper. Mash with a potato masher or a large fork to desired consistency. With a rubber spatula, fold in the onion, jalapeño, garlic, and cilantro. Stir in the lime juice and a dash of Worcestershire sauce. Adjust seasonings, top with the cracklings, and serve. – Set a grill or grill pan to high. If using a grill, set a large cast iron skillet on the grill to preheat. You can also use a grilling basket. Toss the peppers and onions together in a bowl, season with salt and pepper, and drizzle with olive oil. Cook them in the preheated cast iron or on the grill pan, stirring occasionally, until caramelized. Transfer to a serving platter. – Poke the sausages a few times with a fork and lightly coat with oil. Grill until lightly charred and cooked through. Transfer them to a cutting board and cut the sausages into thick slices. – Brush the insides of the rolls with oil and grill them just long enough to toast. 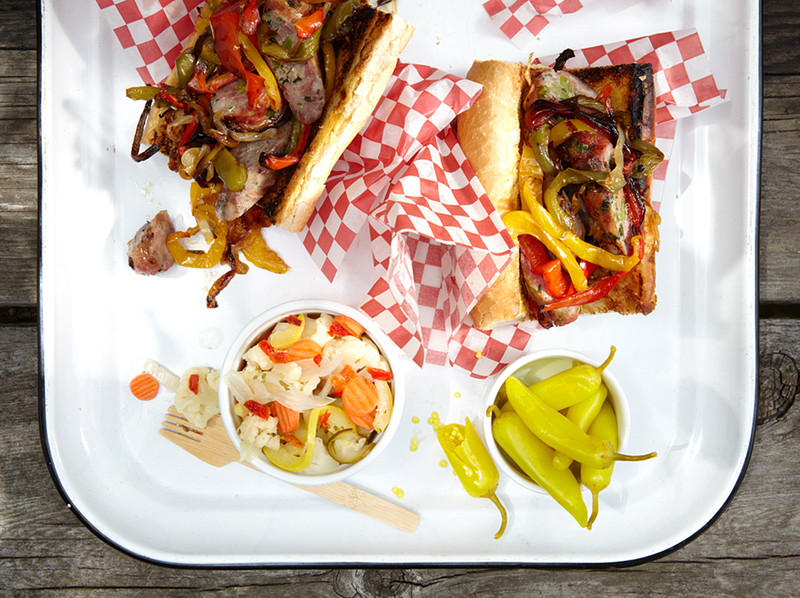 Stuff the rolls with the peppers and onions and sausage. Serve with banana peppers and pickled vegetables if desired. This was our tiny guest at the shoot: Paloma. Little but with a dinosaur appetite! Yes, this is a very kid-friendly post. I have to try your guac recipe. I always keep it super simple with avocado, lime, tomato, S&P but yours looks really good. Try it! It’s pretty basic, and the chicharrones are just an added treat. 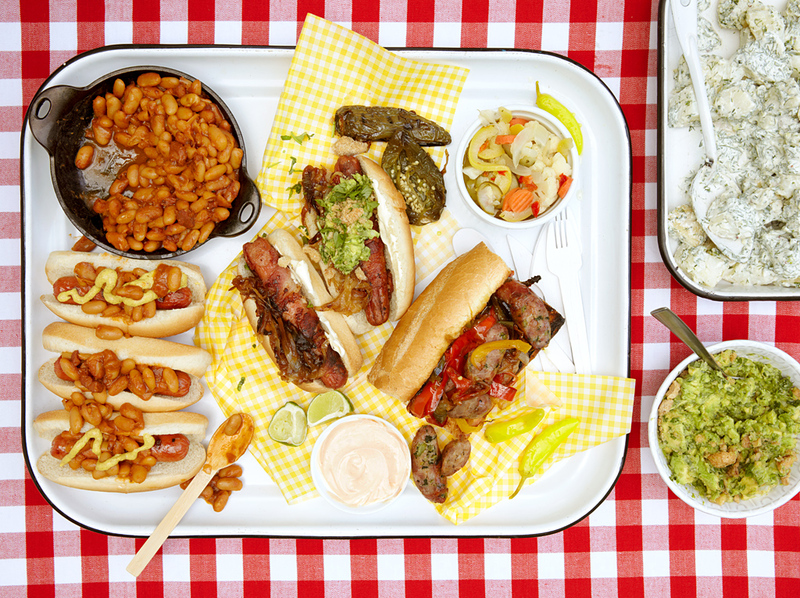 This looks like one decent barbecue! 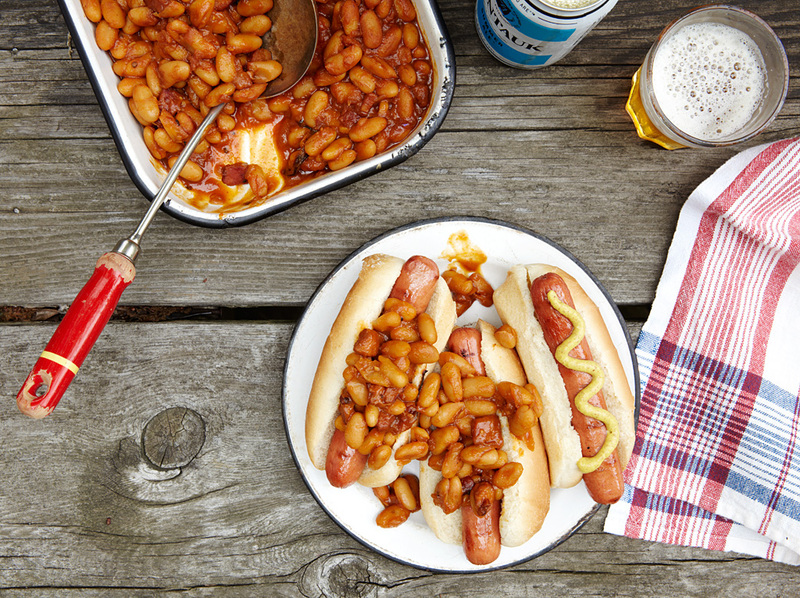 Looks like the perfect feasting foods for the 4th of July! 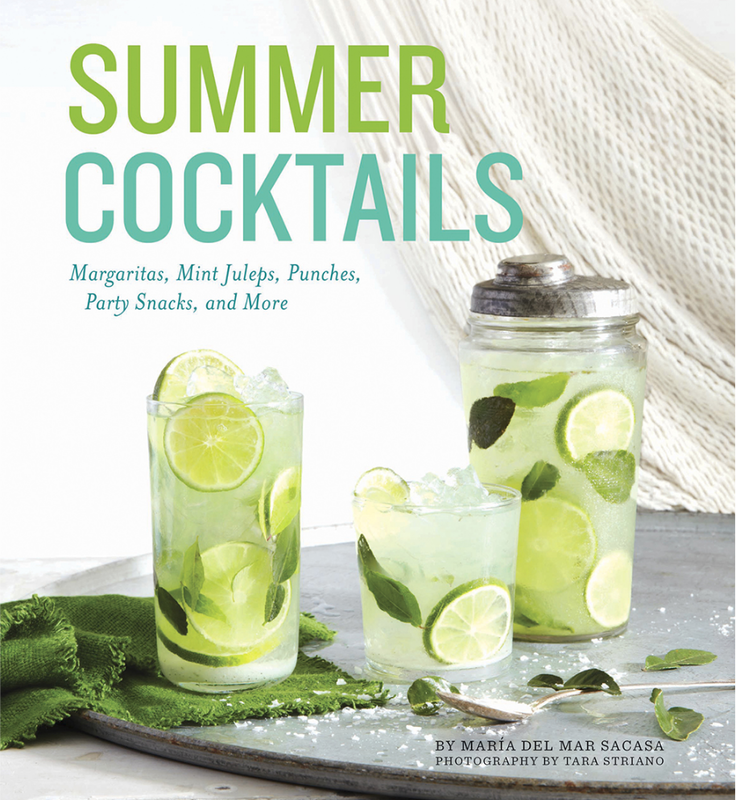 Let us know if you try any of the recipes! Most. Have. Potato. Salad. NOW! But seriously, I love my mustard potato salad but how can you really beat Ranch Potato Salad? Thanks for this – I’m having a garden pot luck on Thursday and you’ve given me tonnes of inspiration! This was 4th of July deluxe! The hot dogs look really yummy! Did you try any of them? Bacon-wrapped…do it. Year round!